Hebron – Israeli forces established military checkpoint at the entrance of Beit Ommar village, north of Hebron. Israeli forces have continued with systematic attacks against Palestinian civilians and their property in the occupied Palestinian territories (oPt) for the reporting period of 09 – 15 April 2015. During the reporting period, Israeli forces killed a Palestinian civilian and wounded 20 others, including five children, in the West Bank and Gaza Strip. The killed the civilian and 19 wounded others, including the five children, were in the West Bank, while a civilian was wounded in the Gaza Strip. In the Gaza Strip, Israeli forces targeted Palestinian fishermen and border areas along the Gaza Strip. In the West Bank, in excessive use of force, on 10 April 2015, Israeli forces killed a Palestinian civilian and wounded four others, including a child; the wound of one of whom was serious, at the entrance of Beit Ommar village, north of Hebron. Israeli forces continued the use of excessive and systematic force against peaceful protests organized by Palestinian civilians and Israeli and international solidarity activists against the construction of the annexation wall and settlement activities in the West Bank. As a result, nine protestors, including three children, were wounded during Kufor Qaddoum weekly protest, northeast of Qalqilya. In the same context, six Palestinians, including a child, were wounded during other protests in the vicinity of Ofer detention facility, southwest of Ramallah; at the southern entrance of al-Jalazoun refugee camp, north of the city; and Sateh Marhaba area adjacent of "Psagot" settlement, east of al-Bireh. In the Gaza Strip, on 14 April 2015, a medical source at Shifa Hospital in Gaza City pronounced a 22-year-old Palestinian from al-Zaitoun neighbourhood dead from wounds he sustained earlier during the latest Israeli offensive in the Gaza Strip. As part of targeting border areas, on 10 April 2015, a Palestinian civilian was wounded when Israeli forces stationed along the border fence opened fire at dozens of civilians who were present 10-100 meters to the west of the said fence, east of Khan Yunis in the south of the Gaza Strip. During the reporting period, Israeli forces conducted at least 55 military incursions into Palestinian communities in the West Bank and seven ones in East Jerusalem. During these incursions, Israeli forces arrested at least 69 Palestinians, including four children and a woman. Thirteen of these Palestinians, including the four children, were arrested in Jerusalem. Israeli forces carried out a wide-scale incursion in Nablus on 15 April 2015 and arrested 25 civilians, the majority of whom are members of Hamas movement. In the Gaza Strip, Israeli forces moved about 150 meters to the east of al-Fokhari village, southeast of Khan Yunis in the south of the Gaza Strip. They levelled lands along the border fence and withdrew later. In the meantime, Israeli forces stationed along the border fence opened fire at agricultural lands in Khuza'a village, but no casualties were reported. The illegal closure of the Gaza Strip, which has been steadily tightened since June 2007 has had a disastrous impact on the humanitarian and economic situation in the Gaza Strip. The Israeli authorities impose measures to undermine the freedom of trade, including the basic needs for the Gaza Strip population and the agricultural and industrial products to be exported. For 8 consecutive years, Israel has tightened the land and naval closure to isolate the Gaza Strip from the West Bank, including occupied Jerusalem, and other countries around the world. This resulted in grave violations of the economic, social and cultural rights and a deterioration of living conditions for 1.8 million people. The Israeli authorities have established Karm Abu Salem (Kerem Shaloum) as the sole crossing for imports and exports in order to exercise its control over the Gaza Strip’s economy. They also aim at imposing a complete ban on the Gaza Strip’s exports. In many occasions lately, Israeli forces arrested Palestinian patients and their companions and traders. On Monday, 13 April 2015, Israeli forces moved into Hezma village, northeast of East Jerusalem. Israeli bulldozers demolished a number of commercial facilities near the village's northern entrance and confiscated their contents. On Tuesday, 14 April 2015, Israeli forces belonging to the Israeli municipality in Jerusalem demolished an under-construction building in Wadi al-Jouz neighborhood, east of the old city, on the pretext of non-licensing. On the same day, Israeli municipal bulldozers demolished a mobile home belonging to Mohammed Shwaiki in al-Ashqariya neighborhood, in Beit Hanina village, north of East Jerusalem. On Sunday, 12 April 2015, Israeli forces moved into Beit Deqqo village, northwest of East Jerusalem. They raided and searched a house belonging to the family of Habes Rayan and arrested his son. On Monday, 13 April 2015, Israeli forces moved into al-Eisawiya village, north of East Jerusalem. They raided and searched a number of houses from which they arrested five civilians. On the same day, Israeli forces moved into Shu'fat neighbourhood, north of East Jerusalem. They raided and searched a number of houses from which they arrested two children. Israeli forces moved into Silwan village, south of the old city of East Jerusalem. They raided and searched a number of houses from which they arrested two children. Israeli forces raided a house belonging to Ibrahim Khalafawi in Beer Ayoub neighbourhood in Silwan village, south of the old city in East Jerusalem. They fired sound bombs in the house and harshly beat his two sons. On Tuesday, 14 April 2015, Israeli forces moved into Silwan village, south of the old city in East Jerusalem. They raided a number of houses from which they arrested three civilians. On Tuesday, 14 May 2015, Israeli municipality officers raided a house belonging to the family of Abdul Rahman al-Shaloudi in al-Bustan neighbourhood in Silwan village, south of the old city in East Jerusalem. On Wednesday, 15 April 2015, Alya al-Shaikh al-Abasi (50) surrendered to al-Ramleh prison to serve 26-month sentence. During the reporting period, Israeli soldiers used excessive force against peaceful demonstrations organized by Palestinian civilians, international and Israeli human rights defenders in protest at the construction of the annexation wall and settlement activities in the West Bank. As a result, nine protestors, including three children, were wounded in Kufor Qaddoum protest, northeast of Qalqilya. In the same context, six Palestinians, including a child, were wounded during other protests in the vicinity of Ofer detention facility, southwest of Ramallah, at the southern entrance of al-Jalazoun refugee camp, north of the city, and in Sateh Marhaba area adjacent to "Psagot" settlement, east of al-Bireh. During the reporting period, Israeli forces arrested three civilians, including two children, in the weekly protests. Following the Friday prayer, on 10 April 2015, dozens of Palestinian civilians and international and Israeli human rights defenders organized a peaceful demonstration in Bil’in, west of Ramallah, in protest at the construction of the annexation wall and settlement activities. The protestors marched by the annexation wall and tried to cross the fence. Israeli soldiers stationed behind the wall, in the western area, and a large number of soldiers deployed along it, fired live bullets, tear gas canisters, rubber-coated metal bullets, sound bombs and wastewater at them and chased them into the olive fields. As a result, a number of protestors suffered tear gas inhalation and others sustained bruises as they were beaten up by Israeli soldiers. Moreover, Israeli forces arrested Samer Mohammed Nasim Bernat (40) but handed him to the Palestinian liaison office in the evening. Around the same time, dozens of Palestinian civilians organised a peaceful demonstration in the centre of Ni’lin village, west of Ramallah, in protest at the construction of the annexation wall and settlement activities. The demonstrators took the streets and headed to the annexation wall. Israeli forces closed the gates of the wall with barbwires and prevented the demonstrators from crossing to the land behind it before they responded by throwing stones. Israeli soldiers fired live ammunition, rubber-coated metal bullets, sound bombs and tear gas canisters at the civilians, and chased them into the village. As a result, a number of demonstrators suffered tear gas inhalation and others sustained bruises as they were beaten up. Also following the Friday prayer, dozens of Palestinian civilians and Israeli and international human rights defenders gathered in the center of al-Nabi Saleh village, northwest of Ramallah, to start the weekly peaceful protest against the construction of the annexation wall and settlement activities. They made their way towards Palestinian lands that Israeli settlers from the nearby "Halmish" settlement are trying to seize. Israeli soldiers closed all the village's entrances to prevent the Palestinian and international solidarity activists and journalists from participating in the protest. As a result, many protestors suffered tear gas inhalation and others sustained bruises as they were beaten up by Israeli soldiers. Moreover, Israeli soldiers arrested three Palestinians, including two children, and took them to an unknown destination: Basel Thalji Taher Ya'coub (19); Osaid Hosam Faqih (16); and Amir Samir Hjaiji (16). 9. A 59-year-old civilian sustained a bullet wound to the lower back. Following the Friday prayer, 10 April 2015, dozens of Palestinians gathered at the western entrance of the Silwad village, northeast of Ramallah, on the road between Silwad and Yabroud villages, near Bypass road (60), in protest at the Israeli policies. Protestors set fire to tires and threw stones and Molotov Cocktails at the aforementioned road and Israeli soldiers. In response, Israeli soldiers stationed in the area fired live ammunition, rubber-coated bullets, sound bombs and tear gas canisters at the protestors. As a result, dozens of protestors suffered tear gas inhalation and others sustained bruises as they were beaten up by Israeli soldiers. On Friday afternoon, dozens of youngsters gathered from different areas of Ramallah and al-Bireh in the vicinity of Ofer detention facility, southwest of Ramallah. They headed towards the facility’s gate that was closed by Israeli soldiers. They set fire to tires and threw stones and empty bottles at the soldiers. Israeli forces deployed around the detention facility and started firing live and rubber-coated metal bullets, sound bombs and tear gas canisters. As a result, three civilians were wounded and taken to Palestine Medical Compound in Ramallah. A 26-year-old civilian, a 19-year-old civilian and a 22-year-old civilian all sustained bullet wounds to their right legs. Also following the Friday prayer, dozens of children and young men gathered at the southern entrance of al-Jalazoun refugee camp, north of Ramallah. They were about 300 meters away from the fence of "Beit Eil" settlement. Israeli forces stationed in the area fired live ammunition, rubber-coated metal bullets, sound bombs and tear gas canisters. As a result, a 14-year-old child sustained a bullet wound to the left leg and was taken to Palestine Medical Compound in Ramallah to receive the necessary medical treatment. Also following the Friday prayer, dozens of Palestinian youngsters gathered in Sateh Marhaba area adjacent to "Psagot" settlement, east of al-Bireh. They threw stones at the settlement's fence. Israeli soldiers stationed there fired rubber-coated metal bullets, live ammunition, sound bombs and tear gas canisters. As a result, two Palestinian civilians were wounded and taken to Palestine Medical Compound in Ramallah; a 23-year-old civilian sustained a bullet wound to the right leg and a 20-year-old civilian sustained a bullet wound to the right leg. The cooking gas crisis has fluctuated due to the closure of Karm Abu Salem for security claims. According to PCHR’s follow-up, Israeli authorities only allow an average of 98 tons of cooking gas into Gaza per day. This limited quantity is less than half of the daily needs, which is 200 tons per day of the civilian population in the Gaza Strip during winter. The lack of diesel and benzene led to the aggravation of the crisis as a result of using the gas cylinder for cars or as an alternative for benzene to run generators. As a result, the demand for gas further increased. For almost 8 consecutive years, Israeli forces have continued to prevent the delivery of construction materials to the Gaza Strip. Two years ago, Israeli forces approved the delivery of limited quantities of construction materials for a number of international organizations in the Gaza Strip. On 17 September 2013, they allowed the entry of limited quantities of construction materials for the private sector. However, on 13 October 2013, they re-banned it claiming that these materials are used for constructing tunnels. Israeli forces allowed the entry of construction materials only for UNRWA and UNDP projects. As a result, construction works have completely stopped impacting all sectors related to construction and an increase in unemployment levels. During the 51-day Israeli offensive on the Gaza Strip in July and August 2014, Israeli authorities did not allow the entry of any construction materials. As a result, vital and infrastructure projects have been obstructed so far. Israeli forces also continued to impose an almost total ban on the Gaza Strip exports, including agricultural and industrial products, except for light-weighted products such as flowers, strawberries, and spices. However, they lately allowed the exportation of some vegetables such as cucumber and tomatoes, furniture and fish. 3 weeks ago, Israeli forces started to ban the entry of wood under the pretext is it used for constructing tunnels. · Hebron: Israeli forces have continued to impose severe restrictions on the movement of Palestinian civilians. At approximately 07:00 on Thursday, 09 April 2015, Israeli forces established a checkpoint at the entrance of al-Fawar refugee camp, south of Hebron. At approximately 16:00, another checkpoint was established on Marah al-Baqar Road leading to the villages of Beit al-Rewesh, Deir al-'Awasal and al-Majd, southwest of dura, southwest of the city. Later, the two checkpoints were removed, and no arrests were reported. At approximately 07:30 on Saturday, 11 April 2015, Israeli forces established a checkpoint at the entrance of al-Smou'a village, south of Hebron. Later, the checkpoint was removed, and no arrests were reported. At approximately 07:00 on Monday, 13 April 2015, Israeli forces established a checkpoint at the entrance of Beit Kahel village, northwest of Hebron. Later, the checkpoint was removed, and no arrests were reported. · Ramallah: Israeli forces have continued to impose severe restrictions on the movement of Palestinian civilians. At approximately 10:00 on Thursday, 09 April 2015, Israeli forces established the intersection of 'Ein Sinia village on the road between Ramallah and Nablus. At approximately 11:00, another checkpoint was established near the entrance of Deir Abu Mesh'al village, northwest of the city. At approximately 17:30, Israeli forces established a checkpoint at the eastern entrance of al-Tibah village, southwest of the city. Around the same time, another checkpoint was established at the entrance of Beit 'Oar al-Foqa village, southwest of the city. Later, all checkpoints were removed and no arrests were reported. At approximately 10:30 on Friday, 10 April 2015, Israeli forces established a checkpoint under the bridge of Yabrud village, northeast of the city. At approximately 12:30, two checkpoints were established at the entrance of al-Nabi Saleh village, northwest of Ramallah and at the entrance of 'Ein Ayoub area, west of Ras Kar Kar, northwest of the city. Later, all checkpoints were removed and no arrests were reported. At approximately 17:30 on Saturday, 11 April 2015, Israeli forces established a checkpoint under the bridge of Kherbtha al-Mesbah village, west of Ramallah. At approximately 20:00, another checkpoint was established near the intersection of “Ofrah” settlement, northeast of the city. Later, both checkpoints were removed and no arrests were reported. · Jericho: Israeli forces have continued to impose severe restrictions on the movement of Palestinian civilians. 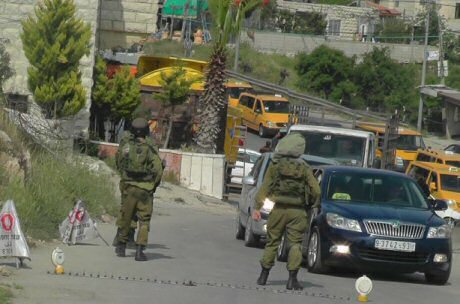 At approximately 09:30 on Friday, 11 April 2015, Israeli forces established a checkpoint near the entrance of Fasayel village, north of the city. At approximately 20:00, a similar checkpoint as established at the southern entrance of Jericho. Later, both checkpoints were removed, and no arrests were reported. At approximately 20:00 on Sunday, 12 April 2015, another checkpoint was established near the entrance of al-Nwei'mah village, north of Jericho. Later, the checkpoint was removed and no arrests were reported. · Qalqilya: Israeli forces have continued to impose severe restrictions on the movement of Palestinian civilians. At approximately 09:40 on Saturday, 11 April 2015, Israeli forces established a checkpoint under the bridge of Iskaka village, east of Salfit. At approximately 18:30, the checkpoint was re-established, and no arrests were reported. At approximately 08:45 on Sunday, 12 April 2015, Israeli forces established a checkpoint under the bridge of Iskaka village, east of Salfit. At approximately 23:00, another checkpoint was established at the entrance of Kafl Haris village, north of Salfit, and obstructed movement in both directions after closing the iron gate established at the aforementioned entrance. At approximately 05:00 on the next day, the gate was re-opened. · Tulkarm: Israeli forces have continued to impose severe restrictions on the movement of Palestinian civilians. At approximately 19:30 on Thursday, 09 April 2015, Israeli forces stationed at ‘Annab military checkpoint which is established on the road between Tulkarm and Nablus, east of the city, tightened their restrictions against civilians and obstructed their movement. Later that day, the tightening ended and no arrests were reported. The tightening renewed at approximately 11:00 on Friday, 10 April 2015; at approximately 16:30 on the same Friday; at approximately 08:00 on Sunday, 12 April 2015, at approximately 08:30 on Monday, 13 April 2015 and 22:30 on the same Monday evening. At approximately 13:30 on the same Thursday, Israeli forces stationed at the gate of the annexation wall near Far'on village, south of Tulkarm, closed the gate. Local sources said to a PCHR fieldworker that the Israeli forces closed the gate in front of the permits holders for unknown reasons. As a resilt, a number of farmers were detained. The gate later was re-opened, and no further incidents were reported. At approximately 08:30 on Sunday, 12 April 2015, Israeli forces established a checkpoint on the road between 'Ezbet Shofah and Shofah, southeast of Tulkarm. At approximately 09:00, Israeli forces established another checkpoint at Far'on village, south of the city. The checkpoint was later removed, and no arrests were removed. · Jenin: Israeli forces have continued to impose severe restrictions on the movement of Palestinian civilians. At approximately 23:00 on Friday, 10 April 2015, Israeli forces established a checkpoint on the main road between Jenin, Tulkarm and Nablus near 'Arabah village intersection, south of Jenin. The checkpoint was later removed, and no arrests were reported. · At approximately 14:00 on Monday, 13 April 2015, Israeli forces stationed at al-Karamah crossing between the West Bank and Jordan arrested Mohammed 'Abdel Rahman Abu Sel (24) from al-'Aroub refugee camp, north of Hebron. He was then taken to an unknown destination. On Monday, 13 April 2015, Israeli forces moved into Hezma village, northeast of East Jerusalem. Israeli bulldozers demolished a number of commercial facilities near the village's northern entrance and confiscated their contents. They also closed that entrance with cement cubes. At approximately 04:30 on Tuesday, 14 April 2015, Israeli forces belonging to the Israeli municipality in Jerusalem demolished an under-construction building in Wadi al-Jouz neighborhood, east of the old city, on the pretext of non-licensing. Akram Abu Shalbak, the building's owner, said to a PCHR fieldworker that an order from the Israeli municipality was issued in the beginning of the year to halt construction works in the 4-storey building consisting of three apartments and other under-construction floors. He added that he started construction works in September 2014, but on 19 December 2014, the Israeli municipality decided to demolish the building on the pretext of non-licensing. Abu Shalbak was able to delay the demolition order several times after resorting to the competent courts and tried to obtain a construction license in the past months, but in vain. At approximately 10:00, on the same day, Israeli municipal bulldozers demolished a mobile home belonging to Mohammed Shwaiki in al-Ashqariya neighborhood in Beit Hanina village, north of East Jerusalem. Shwaiki said to a PCHR fieldworker that Israeli forces moved into the abovementioned neighborhood and surrounded his mobile home but no one was inside. He was able to take some of its contents out and then Israeli forces demolished it. Shwaiki said that the 40-square-meter mobile home was resided by his workers and was established two years ago. At approximately 01:00 on Sunday, 12 April 2015, Israeli forces moved into Beit Deqqo village, northwest of East Jerusalem. They raided and searched a house belonging to the family of Habes Rayan and arrested his son Asem (21). At approximately 01:00 on Monday, 13 April 2015, Israeli forces moved into al-Eisawiya village, north of East Jerusalem. They raided and searched a number of houses from which they arrested five civilians: Anas Ahmed Ebeid (21); Yazan Khalil Moheisen (22); Mousa Nasser Ebeid (19); Mohammed Kayed Mahmoud (21); and Jawad Barqan (38). At approximately 02:00, on the same day, Israeli forces moved into Shu'fat neighbourhood, north of East Jerusalem. They raided and searched a number of houses from which they arrested two children: Mohammed Ahmed Abu Khdair (16); and Mohammed Nidal Abu Khdair (16). At approximately 04:00, Israeli forces moved into Silwan village, south of the old city of East Jerusalem. They raided and searched a number of houses from which they arrested two children: Mohammed Ahmed al-Qaq (15); and Morad Mohanned al-Froukh (16). At approximately 18:00, Israeli forces raided a house belonging to Ibrahim Khalafawi in Beer Ayoub neighbourhood in Silwan village, south of the old city in East Jerusalem. They fired sound bombs in the house and harshly beat his two sons: Maher (19); and Mostafa (21). As a result, they sustained bruises in the face. Israeli soldiers smashed cameras fixed around the house that recorded the house raids and withdrew later. At approximately 03:00 on Tuesday, 14 April 2015, Israeli forces moved into Silwan village, south of the old city in East Jerusalem. They raided a number of houses from which they arrested three civilians: Abdullah Walid al-Salayma (22); Ali Dawood Da'na (21); and Fo'ad Ahmed al-Qaq (21). At approximately 11:00 on Tuesday, 14 May 2015, Israeli municipality officers raided a house belonging to the family of Abdul Rahman al-Shaloudi in al-Bustan neighbourhood in Silwan village, south of the old city in East Jerusalem. His mother said to a PCHR fieldworker that the officers raided the house and photographed it. They damaged its content. She added that the house was exploded on 19 November 2014, and was not rebuilt. It should be noted that al-Shaloudi was killed on 22 October 2014, when an Israeli soldier opened fire at him in al-Shaikh Jarrah neighbourhood in the north of East Jerusalem. On Wednesday, 15 April 2015, Alya al-Shaikh al-Abasi (50) surrendered to al-Ramleh prison to serve a 26-month sentence. Amjad Abu Asab, head of the committee of Jerusalemite prisoners' families, said that al-Abasi, who was arrested on 02 January 2012 at Shu'fat checkpoint, was released on 22 February 2012 and was transferred to house arrest since then so far (38 months of house arrest). He added that Jerusalem District Court issued a 40-month imprisonment sentence against Alya after she was convicted of attempting to stab an Israeli soldier in 2012. The sentence was reduced to 26 months after an appeal was filed. Abu Asab explained that Alya is a mother of six children and a mother of Essa Dawood al-Abasi, a Jerusalemite prisoner in Israeli prisons since 2010.